The fully assembled portable FireBox was invented by Air Burners. Ours are the only machines tested by the U.S. EPA, the U.S. Forest Service, the U.S. Department of Energy and the U.S. Armed Forces to prove their specifications and performance. 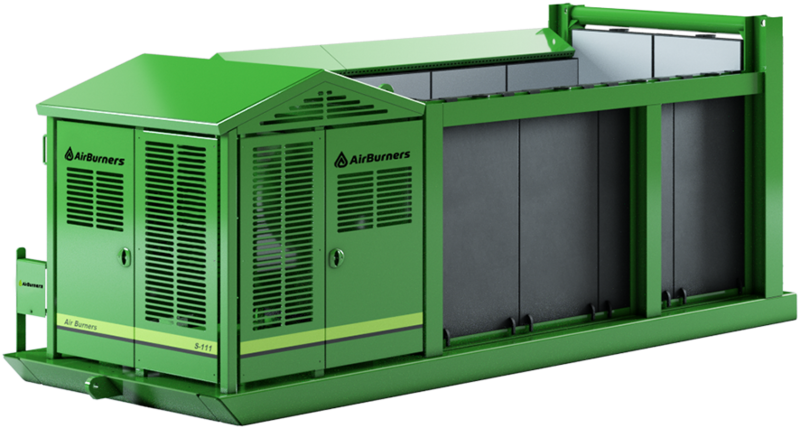 The Air Burners FireBox is the most economical and environmentally sound solution for eliminating wood and vegetative waste. With the FireBox, you do not need to grind, chip, or do any processing of your waste. If it fits in the top, it will burn. Whole logs and root balls are no problem, and you don’t need to worry if there are some dirt or rocks trapped in your waste; it will not affect performance. At the end of your burning cycle, you will be left with clean carbon ash that can be turned into the soil or given to your local agricultural industry. Even if you are required to haul the ash offsite because you can’t turn it back into the soil, you are only hauling one or two percent of your original waste pile. If you burn all day, you won’t even have enough ash to fill a pickup truck. Eliminating all the hauling and grinding will significantly reduce your operating costs. The Air Burners FireBox is designed to support the burning of wood and vegetative waste quickly and cleanly. The FireBox uses “air curtain” technology to eliminate most of the particulate matter (smoke) created while burning. The Air Burners FireBoxes arrive fully assembled and ready for use. They are built on a strong steel skid base, allowing you to drag the FireBox around your site if necessary. The burn chamber is lined with Air Burners’ proprietary thermal ceramic panels, containing the fire and protecting your system. You can easily transport your FireBox on a flat deck or Lowboy trailer. To lower your operating costs, our diesel-powered machines only consume up to 3.5 gallons of diesel fuel per hour. No other fuels are required. Currently, we offer one choice in the 300 series; it is our largest machine, the S327. This machine arrives fully assembled and tested, ready for operation. The S327 will require over-size load permits to travel on most highways. We ship these machines all over the world, typically on flat racks for ocean travel and by drop deck trailers for over-the-road transport. The FireBox can be either dragged onto the trailer with a winch or lifted onto the trailer. We offer one choice in the 200 series, our S220. It is the largest machine we can build for over-the-road travel without oversize permits. This machine arrives fully assembled and tested, ready for operation. We offer two choices in the 100 series. The 100 series machines are designed to fit into a high cube shipping container to ease transport around the world. This machine arrives fully assembled and tested, ready for operation. Over the road, the 100 series unit can go on any flat deck, drop deck, or tilt bed trailer for over-the-road transport. The FireBox can be either dragged onto the trailer with a winch or lifted onto the trailer. The 100 series units all share the same width and height dimensions, but are available in three different lengths. The S119 is the largest and has a 19-foot long burn chamber. The S116 is a medium size unit with a 16-foot long burn chamber. It is typically used at construction sites, in forest applications, and at industrial sites. It is also used at golf courses to eliminate vegetative waste.